“I always tell young people to never give up. If there is life, there is hope,” Clyburn said. 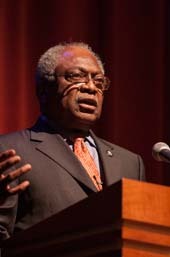 Tidewater Community College welcomed U.S. Rep. James Clyburn to the Roper Performing Arts Center on Feb. 11. Clyburn went on to a successful career in public service and is currently the No. 3 Democrat in the House of Representatives. President Obama said Clyburn is “one of a handful of people who, when they speak, the entire Congress listens.” As the Assistant Democratic leader in the 113th Congress, Clyburn is the leadership liaison to the Appropriations Committee and one of the Democratic Caucus’ primary liaisons to the White House. Clyburn grew up in Sumter, S.C., the eldest son of an activist fundamentalist minister and an independent, civic-minded beautician, who grounded him in family, faith and public service. While a student at South Carolina State College, he organized many civil rights marches and demonstrations, and even met his wife, Emily, in jail during one of his incarcerations. After his remarks, Clyburn answered audience questions, which included queries about the state of health care in America. The program began with welcome remarks from Provost Michael Summers, who was “pinch hitting” for TCC President Edna Baehre-Kolovani. The program included remarks by Edith White, president and CEO of the Urban League of Hampton Roads; William Terry Calhoun, president, Virginia Beach Chapter of Omega Psi Phi Fraternity; and James Gray, president of 200+ Men of Hampton Roads.